In honor of the release of Harry Potter and the Cursed Child, here is another essay from our new anthology of movie essays, Mockingbird at the Movies, available in print here and on Kindle here. Of course, numbers hardly ever justify the cinematic quality of a film, but they do say something about us: Blockbuster films give us characters and plots with which we resonate or with which we would like to resonate (looking at you, 007). 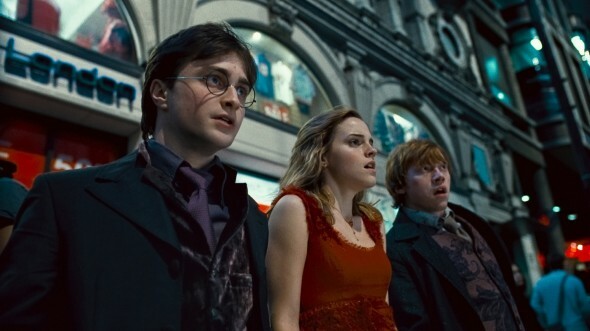 It goes without saying that readers very much resonated with Harry Potter, so much so that they took their obsessions into the theaters with them. Why, though? What is it about Harry? Is it his lowly upbringing in the cupboard under the stairs, and his unknown superstar status? Is it the magical world of Quidditch and Thestrals and Wandmakers that we get to discover alongside him? 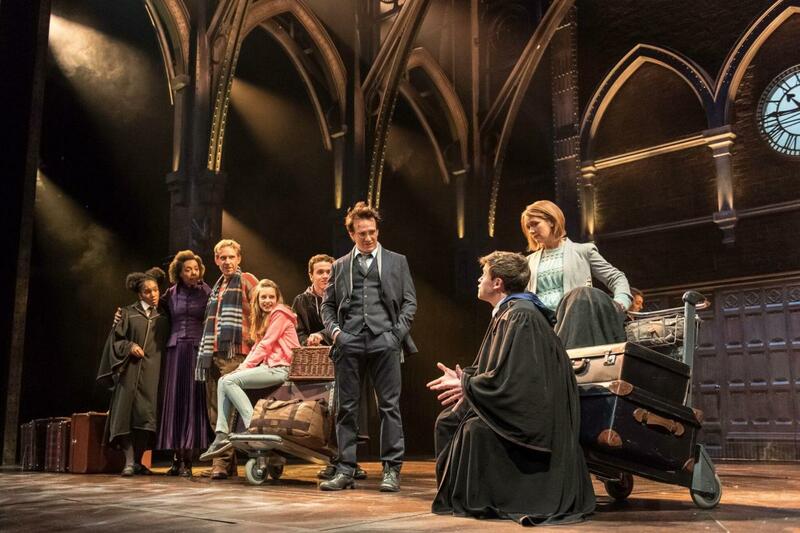 Lord knows we’d all want a wand to choose us! Above all, what is baffling to me is the fact that, in many churchgoing circles, the books were not read and the movies were not watched. For fear of flying brooms and werewolves, many parents forbade their children the opportunity to go to Hogwarts with Harry. Such scorn is to be expected, I suppose, especially when the themes found within the books (and not the magical feats) are the real threat. Themes like love resurrecting the dead, strength proving itself in weakness, hope shining through immense suffering—these messages will get you killed, after all. It certainly didn’t keep the kids from reading the books or watching the movies, though. It instead offered them the mischievous lot of reading the books by flashlight under the covers and watching the DVDs at sleepovers. From these hidden places, with flying cars and live chocolate frogs, they found the wisdom hidden since the foundation of the earth. For muggles and wizards alike. If sacraments are ‘outward signs’ of God’s hidden wisdom, these are the seven sacraments of Harry Potter. It has become the brand: the focal, jagged-tail P that’s emblazoned on X-Box games and bathmats and amusement park merchandise. Harry’s lightning-bolt scar is his Superman ‘S’. It is an ironic mark for a hero, though, because it also represents, for Harry and the rest of wizarding world, an event of immense devastation. But it is just the first hallmark of a recurring theme within the Potter chronicles: of living with one’s wounds, that only through the experience and confrontation of suffering can one ever truly live. Dumbledore foreshadows a thread that will weave from the opening of the first film through to the final scene of the last film: A scar does mark suffering, but it may also act as an avenue through which something useful happens. 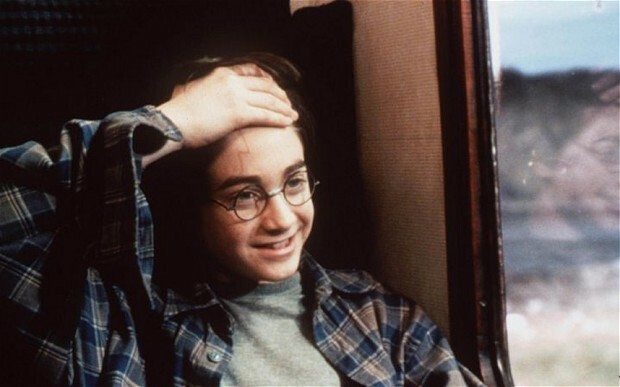 Harry grows to find that his scar is much more than a bragging right; it is a physical and mental connection to Voldemort. Harry is, despite himself, in a living communion of pain with his darkest foe, inseparably linked to him. He can sometimes see what Voldemort sees, feel what Voldemort feels. As Harry grows older, and Voldemort’s powers grow stronger, this link intensifies. Rowling portrays this wound as Harry’s cross to bear, a life inside of him that is not his own, the force of which is nearly impossible to oppose. Harry finds the link to be useful, but this proximity is also intolerable. The pain of this connection is tempered only by the very thing that also saved Harry as a child: love. Harry, in his nighttime wanderings of Hogwarts School, stumbles upon a room completely empty and unused save for an enormous mirror, the reflection of which startles him. In it, Harry glimpses his parents whom he’d never known and always longed to know. It shows us nothing more or less than the deepest, most desperate desires of our hearts…However this mirror will give us neither knowledge nor truth. Men have wasted away before it, entranced by what they have seen, or been driven mad, not knowing if what it shows is real or even possible. The mirror, in fact, does what all mirrors do, albeit on the deepest level: The Mirror of Erised reflects the heart’s desire. In the same way that an average mirror reflects to the viewer a self constrained by its external appearances, this magical mirror makes manifest those invisible deities which lie below the surface. It reveals those idols upon which we’d hang our hat every time, giving us the glory story we wish we had. Rowling betrays a low anthropology here, observing that human beings are incurable escapists. No one wants to accept things as they are, and the deepest-set ‘if only…’ can easily arrest anyone’s ability to live the lives they’ve actually been given. Harry and Ron are drawn into their custom-made fantasy worlds. The Mirror does not reveal a desire to live for others, a desire to love compassionately, to seek truth. Instead, it shows us that the desires of the heart are always self-oriented. 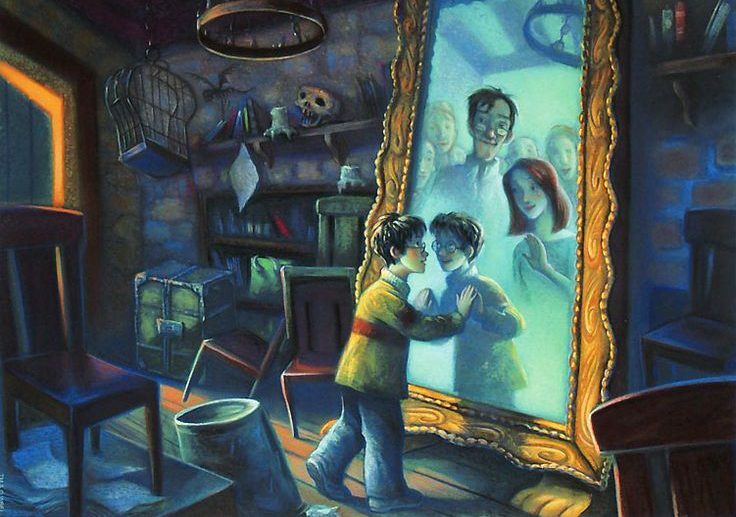 Rather than some external Odyssean temptation to the courageous and pure-hearted, this mirror conveys, as Dumbledore explains to Harry, what lies precisely within us. Dumbledore tells Harry that only a truly happy man could look into the Mirror of Erised and see himself as he is. The Mirror of Erised is powerless over a person who has confronted the givens and accepted them. In Rowling’s universe, then, true contentment—if it is possible—cannot bypass self-knowledge. True happiness means leaving our “private hall of flattering mirrors” (Franzen) and seeing first the person we’re not so proud to see. At this juncture, we are left to wonder, is happiness even possible if it requires the stamina to see the worst in ourselves? It seems that if it was ever possible, Dumbledore would be the virtuous example. Yet, in the Deathly Hallows, Harry discovers that Dumbledore, too, could not escape his own desire for power. He understood Harry’s addiction because he, too, had similar susceptibilities. More on this later. You know, the Stone was really not such a wonderful thing. As much money and life as you could want! The two things most human beings would choose above all—the trouble is, humans do have a knack of choosing precisely those things that are worst for them. The Dementor’s Kiss, its final blow, is one in which the victim’s soul is literally sucked out. This, according to Professor Lupin, is worse than death. The only charm which can defend someone from the dementor is the Patronus Charm. Rather than battling the dementor on one’s own, the wizard who conjures the Patronus Charm is summoning a power greater than they are, which will stand before the dementor and defend them. It is a complicated spell—one must connect with and focus upon a memory that is powerful enough to protect. If one’s picture of happiness is not rooted in love but in exhilaration or excitement, the Patronus founders. In other words, the strength of the Patronus is as strong as the love that generates it. The Patronus is a positive force that stands between the dementor and the wizard. In Latin, the charm’s incantation (Expecto Patronum) means ‘I await a protector.’ The Patronus charm works as a stand-in for the wizard, a spiritual force that acts as substitute prey for the dementors to feed on. 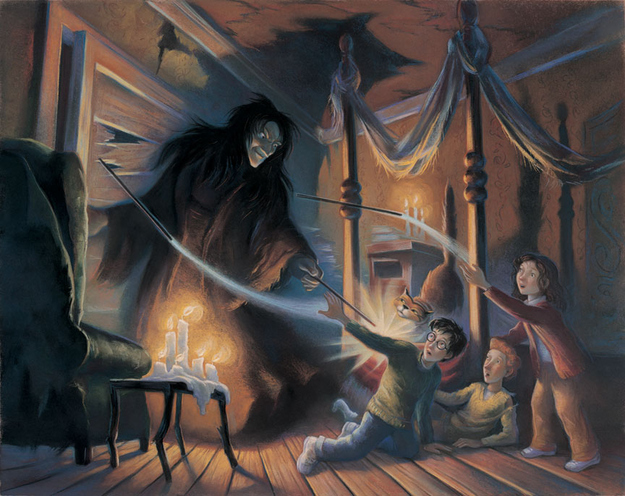 The reason that Harry attracts the attention of dementors is also the same reason that he is one of the youngest wizards to have ever conjured a Patronus: He is stamped (imputed) by the powerful love of his parents. The murder of his parents is more than an eternal stain upon his memory—it signifies the power of sacrifice that gave him life. Through it, Harry has a protector, who communes with him in the deepest depths of grief. The Pensieve, in short, helps make sense of things. It acts as a record book of the shaping elements of one’s personal history, a proper understanding of what one has dealt with and what one carries. In the sixth installment of the saga, Harry Potter and the Half-Blood Prince, Harry and Dumbledore use it precisely to examine the memories and experiences that transformed the infamous Hogwarts student, Tom Riddle, into Lord Voldemort. Harry doesn’t understand why such archaeology is necessary, but Dumbledore seems to treasure the memories as vital clues in knowing their enemy. Here Dumbledore invites Harry into his first memory of Tom, a troubled and friendless orphan with a penchant for pain. After this particular trip into the Pensieve, Dumbledore notes key features of Tom’s psychology: Tom seeks self-sufficiency and isolation at every turn. He has no friends, and has never wanted them. And, above all else, he seeks power. Little did Draco know that Harry is one of those kids, who didn’t know about Hogwarts until he was taken. Ironically, Harry is the meshing of the two worlds. He is in the “old wizarding families”—far more famous than the Malfoys and the Longbottoms—but any credit bestowed by being a ‘pureblood’ is lost on him. He knows nothing about it. ‘Mudblood,’ like the law, marks distinction. It is ironic because Hermione, who is far more distinguished than her peers in actual wizarding talent, finds herself excluded by a worthiness she can’t prove or earn. A daughter of two Muggles, she is—to the Slytherins, the Malfoys, the purebloods—an outsider. Despite Harry’s and Ron’s words of comfort, the place that had once been a celebration of her peculiar gifts now represents, just like any other place, the confusing rift between the haves and have-nots. SLUGHORN: You must understand that the soul is supposed to remain intact and whole. Splitting it is an act of violation, it is against nature. RIDDLE: But how do you do it? SLUGHORN: By an act of evil—the supreme act of evil. By committing murder. Killing rips the soul apart. The wizard intent upon creating a Horcrux would use the damage to his advantage: He would encase the torn portion—There is a spell, do not ask me, I don’t know!…Do I look as though I have tried it—do I look like a killer? RON: Isn’t there any way of putting yourself back together? HERMIONE: Yes, but it would be excruciatingly painful…Remorse. You’ve got to really feel what you’ve done. There’s a footnote. Apparently the pain of it can destroy you. I can’t see Voldemort attempting it somehow, can you? Like most villains, Voldemort has chosen the path that will ultimately lead to his demise. And, like most villains, that demise is rooted in his will to power. Voldemort’s pursuit of immortality has also made him strangely unwieldy. He is, in his immense strength, vulnerable and out of control. In his greed for standalone power, the wreckage required to get him there has involuntarily broken his strength. You were the seventh Horcrux, Harry, the Horcrux he never meant to make…He left part of himself latched to you, the would-be victim who had survived…He took your blood believing it would strengthen him. He took into his body a tiny part of the enchantment your mother laid upon you when she died for you. His body keeps her sacrifice alive, and while that enchantment survives, so do you and so does Voldemort’s one last hope for himself. That (tale) is a children’s tale, told to amuse rather than to instruct. Those of us who understand these matters, however, recognize that the ancient story refers to three objects, or Hallows, which, if united, will make the possessor the master of Death. It is not a subtle hint that a children’s story would contain the key to the magical universe, and that such wisdom would be foolishness to Voldemort. Nonetheless, the Deathly Hallows are: the Cloak of Invisibility, the Resurrection Stone, and the Elder Wand. Historically speaking, they are the original relics of the three Peverell Brothers, incredibly talented wizards who each crafted an instrument of magic that could make them death-proof. Dumbledore had been so allured by the power of the Deathly Hallows that he had tried on the ring of the Resurrection Stone, despite his knowledge that Voldemort had made it a Horcrux. Dumbledore’s motive was to atone for the guilt of the mysterious death of his sister, Ariana. While it was a kind of self-atonement, a different kind of power hunger, it was still his folly: His use of the Stone meant his death. [Voldemort] would not think that he needed the Cloak, and as for the stone, whom would he want to bring back from the dead? He fears the dead. He does not love…Voldemort, instead of asking himself what quality it was in you that had made your wand so strong, what gift you possessed that he did not, naturally set out to find the one wand that, they said, would beat any other. For him, the Elder Wand has become an obsession to rival his obsession with you. He believes that the Elder Wand removes his last weakness and makes him truly invincible. Just as with the other two Peverell brothers, it is this flaw in Voldemort’s logic that will undo him. His quest for power has left him looking for a tool which will make him eternal, rather than seeing in Harry the eternal quality that makes him supreme. That quality, more penetrating than the power of a wand or a life-giving stone, is love. Harry, marked by the love of life lain down, carries it and is compelled to do the same. Harry, in the name of love, lays down his life so that his friends might live. And, because Harry has given up his life, he is given a proper resurrection. This self-sacrificing love is what leads Harry into his encounter with Dumbledore, in an empty King’s Cross Station. There he recognizes that he is the unlikely Master of Death, the bespectacled descendant of the third Peverell brother and, more importantly, because he has died to death: “You are the true master of death, because the true master does not seek to run away from Death. He accepts that he must die, and understands that there are far, far worse things in the living world than dying.” It is in this faith, which looks to all the world like death, that the real magic happens. And it is the hope upon which all of us—Muggle or magic—rely. Order your copy of Mockingbird at the Movies today!
. “J. K. Rowling, the Interview,” The Times (UK), June 30, 2000.